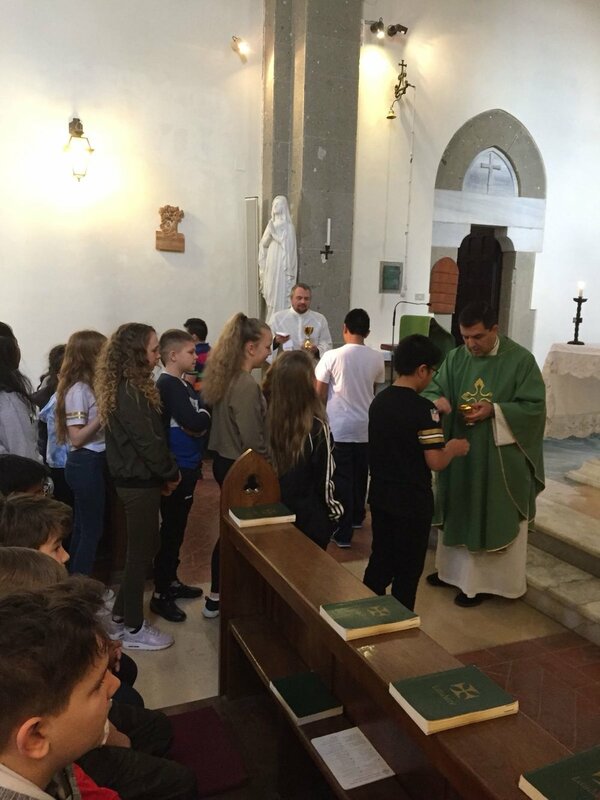 During our February half term break, 40 Year 7 students and 6 staff journeyed to Rome on pilgrimage to the tomb of the apostles, Peter and Paul. During our stay we took in many of the sights and sounds of one of the most vibrant and beautiful cities in the world with history at every turn, and even beneath our feet. We explored the glory that was ancient, imperial Rome with its forums, theatres and circuses, the most impressive of which was surely the Flavian amphitheatre, better known as the Colosseum, where Romans witnessed the brutal spectacle of gladiators fighting to the death and of the first Christian martyrs being fed to wild beasts. We ascended the Victor Emmanuel Monument to get 360% views of the city, and even descended below ground into the Catacombs of San Sebastiano, one of the sacred burial sites of the early followers of Christ. 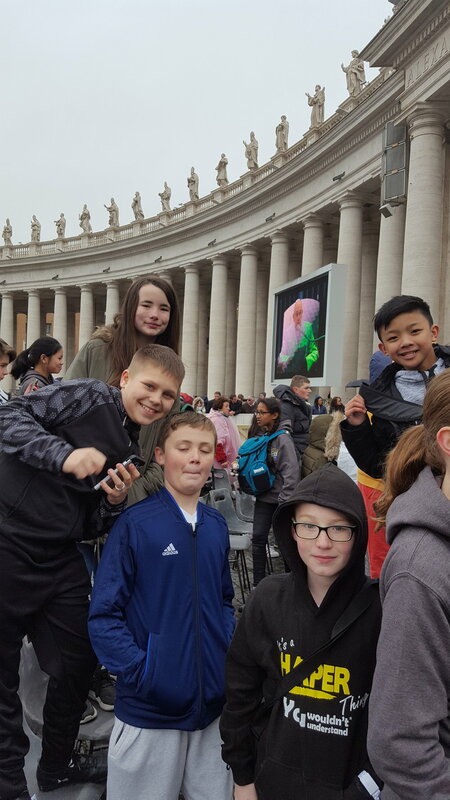 We were awed by the majesty of Christian Rome with the vast, domed basilicas of St Peter’s and St Paul’s, enclosing the quiet, peaceful spaces within, a witness to the enduring value of prayer and contemplation in the midst of bustling modern city living. 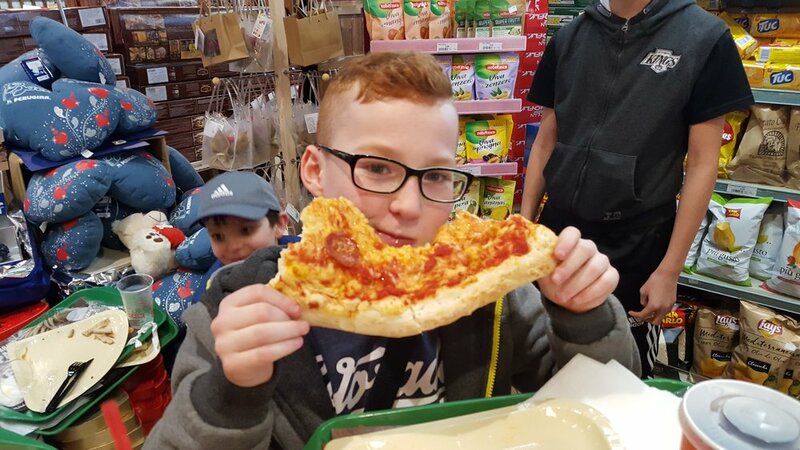 We spent a many enjoyable hours strolling round the cobbled streets, often in Roman sunshine, enjoying the piazzas and fountains, the markets, shops and cafes, not to mention the restaurants where we filled up on authentic Roman cuisine. Our day trip took us out of the city to Assisi, the hill - top town which was home to both St Francis and St Clare. The town commands stunning views over the plain below and is noted, not only for its charm, but for its unique atmosphere of peace and prayer, being the cradle of the Franciscan spirituality. Our present Pope selected his name in honour of St Francis who chose to live his life in Gospel simplicity, close to the poor, just as Jesus had done. Talking of the Pope, one of the highlights of our pilgrimage was joining thousands of other pilgrims in St Peter’s Square as Pope Francis gave his weekly general audience. He even did a couple of laps in his Pope-mobile so that we were able to see him up close. Once again our thanks go to many people who made our pilgrimage such a wonderful experience. We are indebted to Alan Wasowski, a past pupil of St Bede’s and who now studies for the priesthood at the English College in Rome. Through his links to the college he was able to get us tickets for the Pope’s General Audience. As usual, a big, big ‘thankyou’ goes to Heather and Les from Glovers Coaches, not just for their professionalism, but also for their friendship and companionship. They really are in integral part of our pilgrimage and we consider them honourary members of our college. Part of the joy of the whole experience staying at Villa Palazzola on the shores of Lake Albano, and the wonderful hospitality offered us there by Mena, Giorgia, Joyce, Giuseppe, Julie and all the staff who are always so friendly and accommodating. There simply cannot be any school trip to anywhere which enjoys such fabulous food. Palazzola really is the most beautiful base from which to explore the city and its surrounds. Last and certainly not least - our wonderful students. A big ‘thanks’ to you all. You were great fun, you were polite and well mannered, and you were always in great voice. I can’t think of any group we have taken to Rome who have sung as well as you did. You were a great credit to your parents and to the college. You made the whole pilgrimage such a treat for the staff and it was a pleasure to look after you and to share the experience with you. U13 West Yorkshire Cup Champions!